NEW BRITAIN - As the end of the school day neared Tuesday afternoon, some of the brilliant minds and future leaders gathered in the large lecture hall at the Academy of Science and Innovation. There was after all, plenty of celebrate. 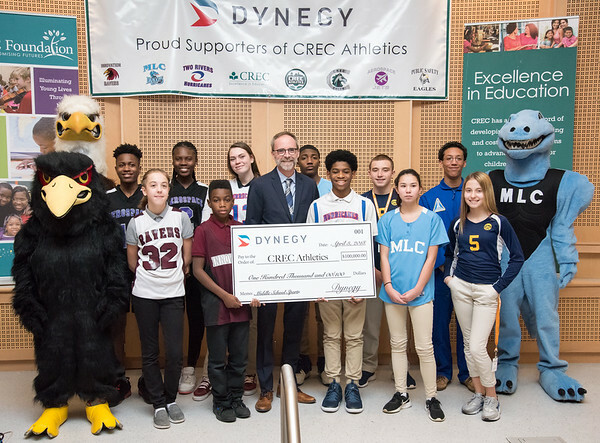 For the third consecutive year, Dynegy Inc. - an energy company based in Houston with power generating facilities throughout the U.S.- contributed $100,000 to the Capitol Region Education Council (CREC) in order to save the middle school sports programs from being cut due to budgetary limitations. Five students from different CREC high schools were also recognized and received awards for their contributions as student-athletes - Chriseny Perryman (Innovation), Celia Chacko (Aerospace), Emily Godeck (MLC), Sajae Willis (PSA) and Natalia Mularzuk (Innovation). While the other four were honored for their individual schools, Mularzuk was the recipient of the first ever Dynegy Citizen-Athlete Scholarship Award. Her dad, Ireneusz, and mother, Boguslawa, were in attendance to see their daughter rewarded for her hard work. The two came over to America from Poland years ago before Natalia was born. She plans to study biomedical engineering and enter the pre-med track. She is still undecided on where she will attend college. There was another first in the building as Chacko will be the first athlete from a CREC school to compete at the Division I collegiate level. Chacko will be attending UConn and running track. While Mularzuk and Chacko are both representing firsts for CREC schools, the other three student-athletes being recognized also have done great things. Perryman made sure to take care of her grandmother when she needed her while balancing school and athletics. She described it as “something no kid should have to do.” Her willingness to step up and accept responsibility showed as she delivered a speech with great passion to it. Godeck helped keep her soccer team focused by helping run practice if their coach was running late. As a freshman, she knew she had great skill on the pitch but made sure not to use it as a reason to boast, yet rather a route to teach and help her teammates grow. Willis took great pride in being named captain for the Public Safety Academy/Academy of Aerospace football team. He would go out of his way to help teammates academically if needed. There’s a reason all five student-athletes were nominated to receive awards and Meredith Moore and Peter Ziegler were the two Dynegy representatives in attendance to learn what the donations have meant to the youth. Moore serves as the head of corporate communications and Ziegler is the Vice President of Dynegy Plant Operations. It was a successful day of school Tuesday at the Academy of Science and Innovation and having the ability to retain the CREC middle school sports programs for athletic director Jonathan Winer is a necessary step to ensuring many more students like the five recognized walk through the doors of the schools throughout the future. Posted in New Britain Herald, Innovation on Tuesday, 3 April 2018 21:02. Updated: Tuesday, 3 April 2018 21:13.